← Blog 6: In which I include a poem written by a 23 yr old me. I definitely have a thing about the name Joseph. I chose it as my Confirmation name. It is also my son’s name. 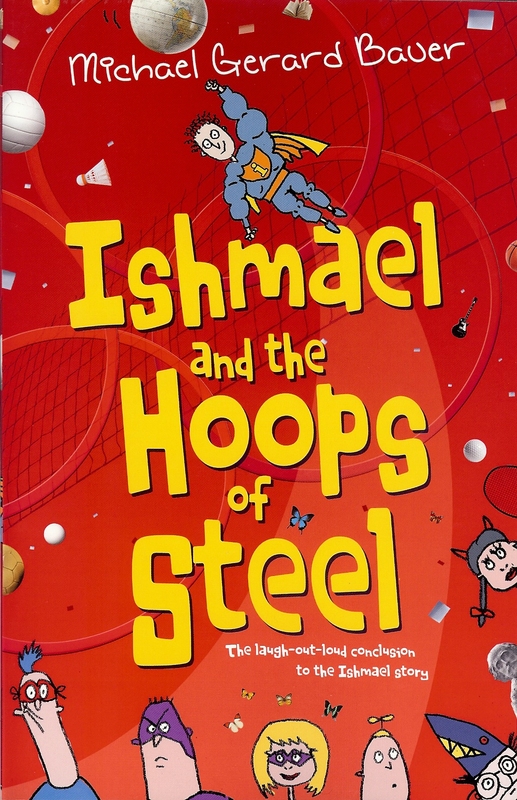 It was the name I used for the main character in my novel The Running Man. 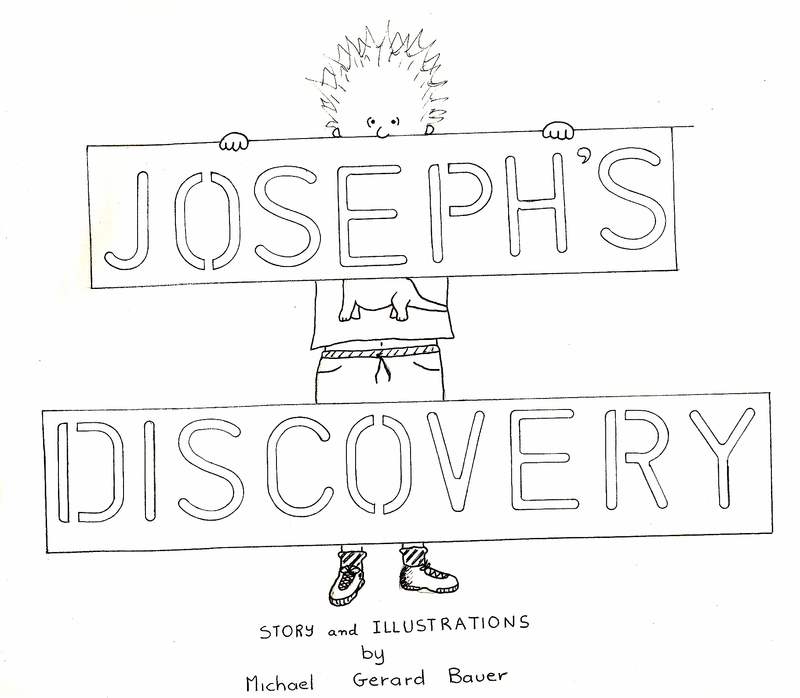 And my first and only attempt at writing a picture book was called Joseph’s Discovery. The picture book was about a little boy called Joseph (what a shock!) 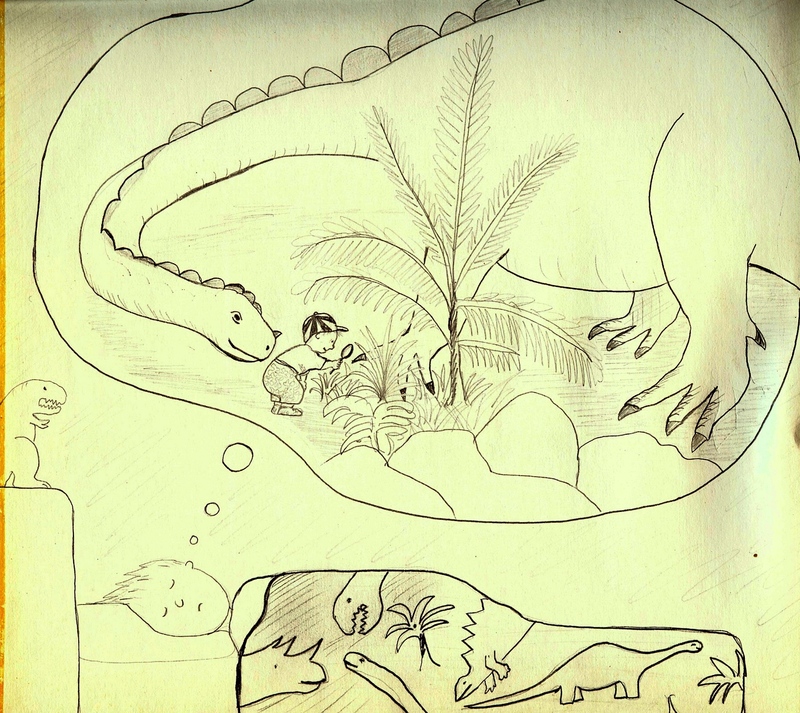 who was obsessed by dinosaurs and dreamed of discovering a dinosaur of his own. In the story Joseph attempts to draw a T-Rex with some surprising results. The book was inspired by my son Joe who loved dinosaurs and who, at Kindy, when others kids were drawing stick figures and mutant-looking cats and dogs, was drawing anatomically correct T-Rexes etc. At one stage he also started a journal where he was attempting to draw every individual dinosaur bone in every dinosaur known to science and label it with its correct scientific name. Joe was a constant source of amazement and wonder to Ard and me. He still is. As well as writing the words I also added simple pencil sketches just to show how I thought the story would work. Here are two pages from near the beginning. Every day Joseph read his dinosaur books, sang his dinosaur songs and played his dinosaur games. Sometimes, he even became a dinosaur. I liked the story and it was fun creating it. Unfortunately though it was rejected (along with some encouraging words) by each of the half-dozen or so publishers I sent it to. Reading it now I think I know why. Or at least, I can see things in it I would change. These days too, I understand a bit more about how expensive picture books are to produce and why many are written but few are chosen. I realise too, that I’m no Shaun Tan. But then again, who is? In the end, I made a special, one of a kind, picture book just for my special, one of a kind, son. And Joe’s always loved it. Gotta be happy with that. This entry was posted in Uncategorized and tagged picture book, Shaun Tan, Writing. Bookmark the permalink. Thanks for the comment earlier on the Kath Battersby post. I just discovered your blog and I love what you reveal in it. Going behind the scenes on your writing life is a real adventure. And I love the illo of dinosaur boy on the stairs. My sons would enjoy it, too, I’m sure. Perhaps a cultish iPad release? Illos as originally submitted. Michael Gerard Bauer’s first book, previously unreleased, written for his son. It’s a great pitch. I know how obsessed any child becomes with their favourite thing, be it horses (me), dinosaurs, cowboys or a band. I think this is a story waiting for another chance to shine. Lovely book Michael. I’m doing one for my granddaughter, to teach her how to find things she has lost – like shoes. It is ‘retrace your steps’ style. But just for her. I may post it if I ever finish it. What a lovely post Michael and I’m sure that book is totally special to your son. Nice, Michael. I’ve written a couple of picture books (one in 1992–more a one off for myself) and one (text only, no pictures drawn for it) last year. Have since found out how difficult it is to even have your m/s looked at if you’re unpublished, so haven’t sent my pic book m/s from last year off to any publishers. I mean, are there *any* publishers who accept unsolicited books in Australia? Very few and none that I could find for picture book manuscripts (at least in Oz) in the Australian Writers Marketplace. Even made a couple of phone call enquiries and asked children’s book author friends on FB. Basically, if you haven’t been published and don’t have an agent, there’s no point trying. I went to Hazel Edwards picture book workshop at QWC last year and discovered that only a handful of picture books are published each year in Australia–something like five or six (because of the cost involved in publishing children’s books). These are mainly spots given to established/proven/published children’s book authors, as you’d know. Not to worry, but not going down that path now that I know how few books are taken up each year. Nil chance. Not whingeing: just being realistic. Anyway, good to see that you were into dinosaurs from way back. I know you’ve published a book with dinosaurs in it. Love your drawings too. Anyway, I’m not writing now, but it’s always good to read your blog posts. Certainly the best outcome a father could hope for, and not a bad place to start for an author either =) After all, kids can be the harshest critics, right?